1 Cut tips off wings; cut wings in half at joint. 2 Heat oil in medium saucepan over medium-high heat and cook onion, stirring occasionally, 5 minutes or until golden. Add syrup, ketchup, bourbon and hot pepper sauce. Bring to a boil over high heat. Reduce heat to low and simmer, stirring occasionally, 5 minutes or until sauce thickens slightly. Remove from heat. With wire whisk, stir in Hellmann's® or Best Foods® Real Mayonnaise until smooth. 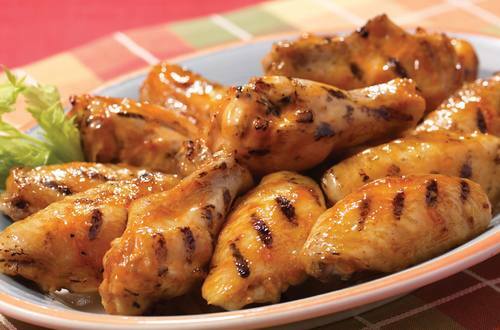 3 Grill or broil chicken wings, turning occasionally and brushing frequently with sauce, 15 minutes or until chicken is thoroughly cooked. Variation: Use a 2-1/2- to 3-pound chicken, cut into serving pieces instead of chicken wings and grill 40 minutes or until chicken is thoroughly cooked.